Modeling a car in Autodesk 3ds Max is not as hard as you would think. This tutorial will teach you how. We start with the basics of 3D Car modeling. From setting up the background pictures, and modeling from Plane objects. Just model a rough shape of the side of the body, and start cutting out Elements like the door, handle, and lights. Select the Border sub object, and Hold the Shift key, and Drag on the X axis to build a rough 3D model. 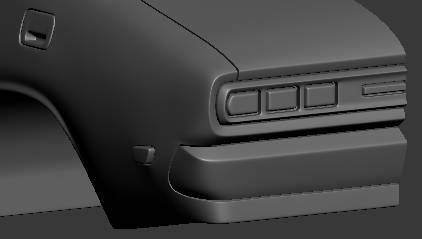 Then you can start modeling the bumper, hoods, and windows. Model from new Plane objects and shape the front & back grills and lights. 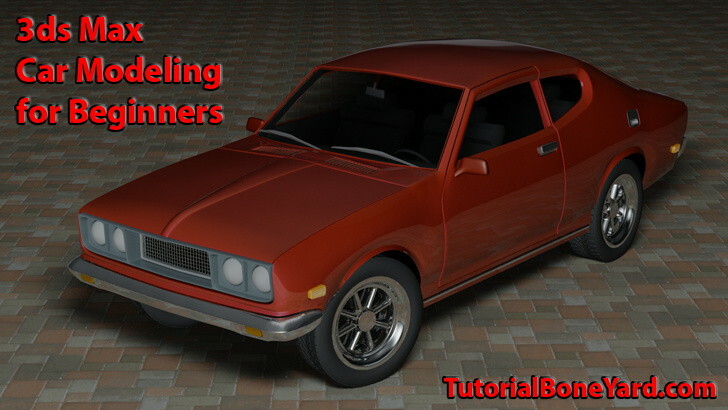 The video tutorial and written tutorial below will show you step by step how to model a car in Autodesk 3ds max. Setup the background images. See Background Setup tutorial. Create a Plane object. Then move it out on the Y axis. Convert to Editable poly. And Right click to go to Object Properties and checkmark See Through. Go to Vertex mode to start a rough shape of the background. Go to the Top view and move the top points and bottom points up to match the background. Now we have a rough 3d shape of the left side. In Edge Mode, add two edge loops using Insert Loop if you are using the Graphite Modeling Tools tab, or use Ring and Connect. Space the vertices out evenly. Use Cut to create a new edge loop to separate the windows. Now to make each vertical line of points curved. We need to because of the new edge loops. Select one line at a time and click Hide Unselected. In the Front view, move the points on the new edges out a bit so the line is smooth in its curve. When you are done click Unhide All. As you go down further you might need to Hide the polygons to see what you are doing. Go to Polygon mode and hide the mesh you already shaped. Ignore the window area. We want this to be flat. Just curve the side of the body. When you are done with the last line of points to curve, check the Top viewport to make sure all points are where they should be. Check the Front and Back views and make adjustments in Vertex mode if need be. Let’s make the outline edge loop for the door. Cut new edges where we need them, to make the polygons 4 point. Triangle polygons, and 5 point polygons are ok on a flat surface, but not on a curved one. Now to model the side windows. In Polygon Mode, go and Inset the polygons a bit. Go to Vertex mode to match the points to the background image. Go back to Polygon mode and in the Top viewport, negatively push in the poly’s on the Y axis. This will make an indent. Chamfer to create hard edges in TurboSmooth. Fix the triangles. Try not to leave any 3 point or 5 point polygons except on a flat surface. This makes for a cleaner subdivision in TurboSmooth. Fix the mesh to an all quad connection. Use Remove in Edge mode to remove a couple edges, and Cut new ones in. On the edge shown hold shift and drag a bit on the Y axis. Select the shown edges and use Connect to add an edge loop down the middle. In Vertex mode, fix the corner and space the edges. Select the edges that will make the outline of the door. Go to Chamfer. Fix any triangles. Go to Polygon mode. Select all the polygons in the middle of the Chamfered edges. Extrude negative on Y axis (by Local Normal). Delete to erase the polygons. Now we have two separate Elements. Apply a TurboSmooth modifier to the stack with 3 iterations. Notice the edges are rounded. We want the edges to be sharp at near 90 degrees. Let’s start on the body. Go to Element mode and select and Hide the door. We have to tie down the corners so they do not smooth and round. Use Cut in Vertex or Edge mode. Add a tight edge loop shown here to prevent that spot from curving under TurboSmooth. Create tight loops to sharpen the edges. 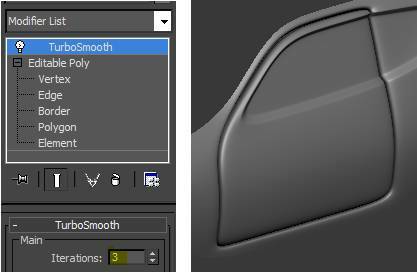 Turn on TurboSmooth to see the hard edges. 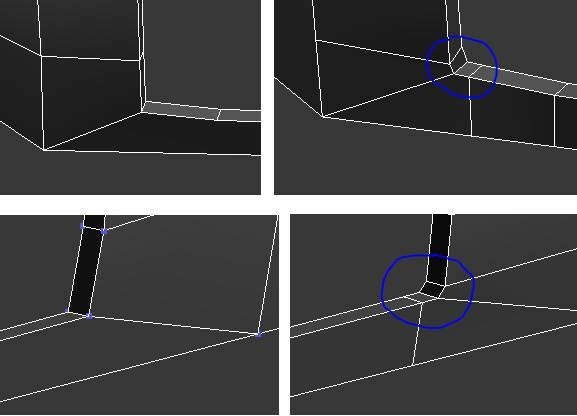 To make sharp corners, create a tight edge loop in the first picture, then make tight edge loops for the corners to prevent them from curving under TurboSmooth. Tie down the left corner of the window like below. Now all edges are sharp. Go to Element, and Unhide All. Turn TurboSmooth on. This is how we get nice grooves between Elements of mesh. As you continue modeling, in the Edit Geometry rollout, it is sometimes useful to use constraints on the vertices while you move them. This is so you do not mess up the geometry you already created. If you choose Edge Constraint, then when you move vertices, they will stick to the edge loop that you created. 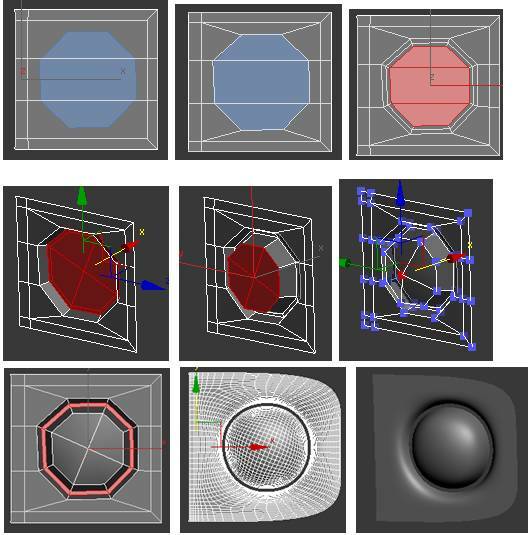 If you choose Face Constraint, the vertex(s) will stick to the polygon surface area it is on. Be sure to go back to the default None when finished. NOTE : Turn Constraints to None after you are done moving points or edges. We need to add 2 new edge loops to round the mesh where the tires will be placed. Now turn Constraints to Edge, and move the new vertices tighter together, until the bottom vertices match the background curve. Then comes the hard part of making the mesh all quad points. Use Remove in edge mode to remove unwanted edges. Use Cut to add new edges, as well as Target weld to join points in Vertex mode. Eventually you will get things looking like the pic on the far right. InVertex mode make a square for the gas tank lid as shown. Then do the same fix for the front end. Isolate object and turn on TurboSmooth. The body might look a bit banged up. So it is just a matter of smoothing the vertical curves in the mesh. In Vertex mode pick a point, then Orbit around to see points that are in or out too far on the Y axis. Be careful and pull or push those points just a bit on the Y axis. 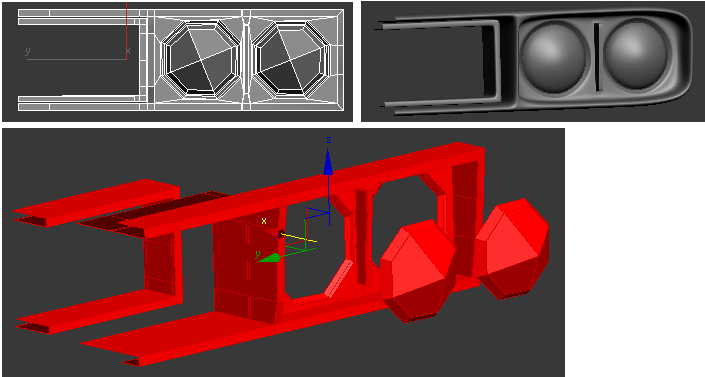 In Vertex mode, select points where the dents are, select vertices and use the Relax settings. Check the Top, Front and Back viewports to make sure the mesh is following the background. Use the Hide Selected, Unhide All, and Hide Unselected, in Vertex and Polygon mode to see if the vertical lines are evenly curved. Now most blemishes on are gone. A little more work and everything will look evenly curved and polished. Inset the poly for the gas tank lid. Add the new edges below. Then Chamfer the inner rectangle. Select the polygons inside the chamfered edges. Negative Extrude Local Normal. Delete the polygons. Now we have a thin gap separating the Lid and body. Both are now separate Elements. In Polygon mode, Hide the Lid Element. Before going to TurboSmooth, Chamfer the outside edges below. Unhide all Elements. Then Hide the body. Do the same thing with Chamfering. Unhide all Elements, then go to TurboSmooth. We have a nice even gap with sharp edges. For the Lid handle, add the edge loops below. Select the poly and negative Extrude. Chamfer, Chamfer for hard edges. See what it looks like with TurboSmooth applied. It does not distort the smooth surface. Both are separate Elements now. Same deal with the Door Handle. Take note of the edge loops that constrain both Elements. Same as the forward and rear side lights. Ok, I will pick up the pace, since most of the fundamentals we have covered. Select the border of the object. Hold Shift key, and Drag on the X axis to build a rough shape. Make Planar Z, to straighten the edges vertically. Now we have one half. Once we finish modeling this half, we will mirror it with the Symmetry modifier. Add two edge loops for the body. Ok this is a bit more complex, but the same principles apply. Minimize the number of triangle polygons except on flat surfaces. On curved surfaces triangle polygons can pinch the mesh under subdivision like TurboSmooth. Try and keep all polygons 4 point (quad) if possible for smooth subdivision. As you can see you make an indentation in Polygon mode and make Cuts for the geometry. In Top down view, you can see the geometry for each rectangular hole. Note the vertical edges that will restrict the smoothing a bit. Select and delete the polygons to make the holes. To give it a bit a of shape, select the edges as seen below and lift up a bit on the Z axis. Turn on TurboSmooth, and you should have something like below. By now you should have a grasp of basic modeling techniques with Vertices, Edges, Polygons, and the basic tools to use. Select the polygons below and Extrude them a bit. Select the edge loop in the middle. Pull it down and to the left just a bit. Go to Vertex mode and even out the points in the Top viewport against the background image. Add more Chamfered loops. Select the polygons where the Bumper will separate. Negative Extrude Local Normal. Turn TurboSmooth on to see the results. The rear bumper is done the same way as the front. Start with a square Plane object. Use an eight sided Cylinder as a visual aid. Right click the Plane and checkmark See Through. Add a TurboSmooth modifier. Then follow the progressive modifications seen below. Finally, in Polygon mode, select the polygons to Delete to separate the mesh into Elements. In the Front viewport, create a Line with the settings you see. Then hold Shift and Drag to Clone. Choose Copy and Number of Copies. 30 in this case. Go back and make a horizontal Line with the right number of copies. Finally, select one Line and click Attach Multi to make one object. The rear is the same thing… start with a Plane object, and use modeling methods to manipulate Edges, Vertices, and Polygons. Below are the separated elements. Here is the TurboSmooth results of the back end. All the other Elements were created just the same way as you can see below. Add a Symmetry modifier above Editable Poly. Choose a low Threshold for the auto welding. Click the Mirror sub mode and slowly move the mirrored half until it sticks to the other one. For a total layman like me, this looks like magic! Nice, very nice. Too bad I don’t know anything about 3DS max. I don’t know anything about the pictograms, the menus etc… . I’d love to be able to make a model of my own car. I can’t find any blueprint and I’m going to try to make my own blueprint using insight3D and photos I’m going to take from my car. Thank you. You can download a trial version of 3ds Max. It comes with tutorials. I think ‘insight3D’ is good for the purpose you want…that is converting images into 3D. Hi, what is the actual car model that was used?